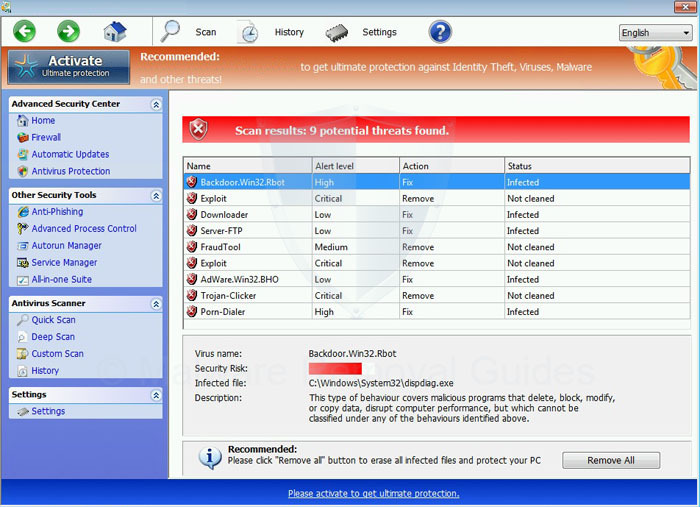 Windows Antivirus Master from the FakeVimes family is a fake security program classified as rogueware which pretends to be a legitimate security program and claims that malware has been detected on your computer and displays false scan results, fake security alerts, and does not allow you to run any application on your computer. When the fake scan is finished, you will be prompted to buy Windows Antivirus Master to clean your computer and the infections that have been found. The Windows Antivirus Master rogueware is distributed through compromised web sites that exploit vulnerabilities on your computer like Java and through fake online scanners that state you are infected and then prompt you to install the Windows Antivirus Master to scan your computer for the precense of malware. When you try to start a security program like a malwarescanner on your computer, Windows Antivirus Master will automatically close it and will state that the program is infected. If your computer is infected with Windows Antivirus Master, then you are seeing the following screens and msessages, follow the guide below to remove the Windows Antivirus Master rogueware from your your computer with free software. All tools used in our Windows Antivirus Master Removal Guide are completely free to use and should remove any trace of malware from your computer. Please download Rkill to your desktop. Double-click on the Rkill.com to run the tool. If using Vista, Windows 7 or Windows 8 right-click on Rkill.com and choose Run As Administrator. If not, delete the file, then download and use one of the Rkill versions below. When you see the following message Rkill has terminated successfully the malsicious processes. You should now be able to run your normal security programs so that you can scan for computer infections. Start your computer in Safe Mode with Networking and scan for malware with Malwarebytes Anti-Malware. 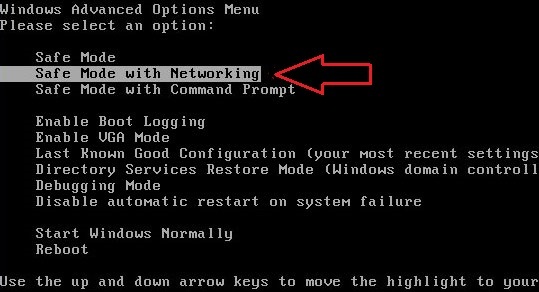 You can also use Safe Mode with commandprompt, type after the prompt Explorer.exe and then press ENTER. Download Malwarebytes Chameleon from the below link and unzip it to a folder on your desktop. Open the Malwarebytes Chameleon folder and double-click on svchost.exe. If Malwarebytes Chameleon will not start, double-click on the other renamed files until you find one that wil start the Windows commandprompt. Follow the onscreen instructions to press a key to continue and Chameleon will proceed to download and install Malwarebytes Anti-Malware for you. Once it has done this, it will update Malwarebytes Anti-Malware, and you’ll need to click OK when it says that the database was updated successfully. Malwarebytes Anti-Malware will now attempt to kill all the malicious processes. Please be patient, this process can take up to 10 minutes to complete. Next, Malwarebytes Anti-Malware will automatically open and perform a Quick scan.